Which is most valuable brand on the world? Most of the peoples will say Apple (or) Google. But its wrong now, yes Facebook beats Apple and Google in their Q3 result. For the first time General sentiment included social networking sites to its ranking list. 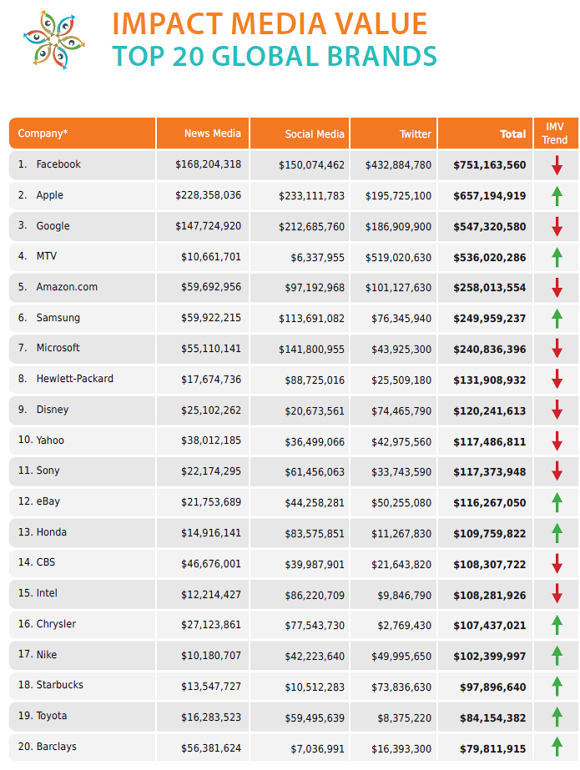 As General Sentiment report Facebook gets $750 million which is #1 in rank this list. Apple got #2 in this list and earns $657 million. Google which was No. 1 in last quarter earning now down to #3 with earning $547 million. Facebook joined our impact media value ranking this quarter, claiming the first place spot as barron's declared its stock "still too pricey". Meanwhile, Apple passed Google and retained its second place spot as the iPhone 5 debuted to much excitement and the iOS 6 Map attracted great deal of negative press.